"I hate having a racecar in front of me, I want to be in front of it. And I do whatever I can to get by it." I love sports, I think I would watch synchronized napping if it were an event on ESPN. But I have never understood the thrill of racing. Other than knowing that the first one across the line gets a big fat check, I don't see much point to it. Sure, the crashes are fun to watch and occasionally the race is close enough to cause some sort of tension; most often, though, it's just cars going around an oval at high speeds. So it was with great trepidation that I put Super Racers into my player. I still don't get the point of racing; but for fans of the sport this is a good disc. Divided into four sections, Super Racers shows both the technical and physical sides of racing, with in-depth looks at Indy, Off Road, Stock, and Drag racing. There is not a lot to grab the attention but there are a few sporadic moments of interesting information. I was fascinated by the amount of technical preparation that goes into to building a racecar. From using computers to simulate wind sheer, to state of the art engineering software to perfect such minute details as the average height of the tires, there is a lot of amazing information. Super Racers is also very well made. Director/cinematographer Rob Englehardt uses quick editing and a clever sound mix to simulate the environment of a racetrack. The only downside—other than my lack of interest in racing—is the dull narration by James Brolin. He has such a flat way of speaking that often his voice made me want to drift off to sleep. 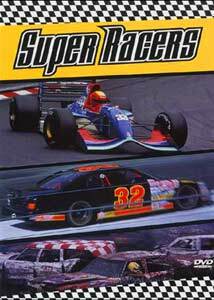 It doesn't help matters that the superior Super Speedway hit shelves first, leaving Super Racers a bit late to the party. Super Speedway is a much quicker, interesting documentary and while it focuses only on Indy racing, it is still the better film. Image Transfer Review: This is a very good-looking transfer from Unapix. Presented in full frame, the print does look a bit soft in places, but for the most part there are very few flaws. Moments of slight dirt and grain pop up, and there is no pixelation evident. Black levels are fine as are detail and sharpness, which are never a problem. Audio Transfer Review: The real treats on this disc are the absolutely amazing DTS and Dolby Digital 5.1 tracks. From the opening menus to the closing credits the surrounds never shut down. Engines rev, crowds cheer, and even music plays in this highly creative sound mix. The only down side is that the dialogue from narrator James Brolin is produced from the left and right channels as opposed to the center channel. That is a small complaint when you consider that the sound mix overshadows everything else. Extras Review: Not an extra is to be found on this bare bones disc. Even a display for the amount of time remaining is absent. I am sure that my dislike of racing did not help this review, but there is no denying that for fans of the sport, this is a must have documentary. The sound quality makes it a good reference disc—I have even pulled it out a few times to show off my system. Super Racers is worth a look—and a listen.